Life is a series of defining moments, with a lot of other boring stuff in between, mixed up in an order that doesn't seem to make much sense. A story is just the series of defining moments. It took me a series of unusual events combined with chronic illness over a period of 17 months to realize how much I like stories. I have consumed my fair share of stories in books and television, and I have collected my fair share of stories in life. 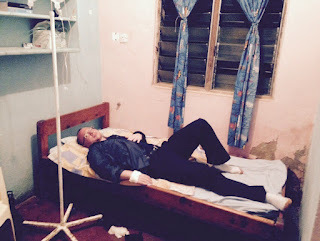 Here is a picture of me in a hospital bed in Kenya after vomiting blood, but before having to work on a farm to get a ride to the airport to escape. There were times over these past 17 months when watching television was the most active thing I could do. I couldn't walk all the way across the room without having to stop and take a break, but I could sit on the couch in a mental fog, hands shaking, heart pounding for no apparent reason, seeing stars, with an intense migraine, and watch a show. Granted, the sound and light did hurt, but you can only lay in the silent dark for so long before you realize that the pain is worth it. It is worth it to experience a story. It was during this extended ordeal that I realized I had fallen in love with stories a long time ago. My parents emphasized reading, and I took to it like a fish to water, immersed. I have consumed thousands of stories, and now there is an urge to create welling up from within. There are six types of stories that I am interested in writing: short stories, novels, memoirs, stage plays, television series, and movies. The issue would seem to be... lack of skill, experience, knowledge, resources, and connections. Humans process information best by putting it into a story, by having a personified subject go through a series of ordered events (this is the Narrative_paradigm). Whether it is a woman working at a grocery store talking about her co-workers, or Elon Musk telling the story of the future of humanity, our lives are made of stories. Most of my experience in storytelling comes from impromptu public speaking, which I enjoy, and a few trials at putting psychology and philosophy concepts into stories to try to make them more digestible. More recently I have realized that I like the stories more than the concepts. There are at least three methods that I am using to learn the skill of writing stories. I am watching television pilots and features with script in hand and asking, "why?" I am reading novels and asking, "does this work?" I am watching television shows and making the script based on what I am seeing. I am starting with a small piece of a story and slowly adding to it, like layers in a painting to add depth, subtlety, and texture. In addition to that I am studying Poetics by Aristotle, The One Basic Plot by Martin Turner, and the courses by James Patterson, Shonda Rhimes, Aaron Sorkin, and David Mamet on Masterclass. What I am going to make next is an experiment in writing, a building-up of a story. It is just an experiment. I am going to start with one character and no reversals, discoveries, or moments of suffering. It is just intention-action-resolution. Thirst, an uncomfortable feeling to say the least. He hadn't thought that it would be so hot when he left the house. Luckily there was a store just over the next hill. The bottled water was refreshing, and the perfect amount was left for him to make his walk back home. This story is pretty boring, even though I added a little bit of motivation/stakes and a small error in expectation on the part of our protagonist. It could have been, "this guy was thirsty so he bought a bottle of water," but I couldn't bring myself to write something that boring. Next, I am going to add an obstacle and see what happens. Closed? In the middle of the day? On a Thursday? He knocked on the door - nothing. He banged on a window - nothing. He cupped his hands and pressed his face to the window - darkness. He would have to ask the next time he saw them why they were closed today. It was rather inconvenient, he would be pretty thirsty by the time he got home. This story is a little more interesting, but in the end it is unsatisfying. A store is closed on a Thursday and a guy has to walk a little bit further to get water. Why is this a big deal? It isn't, thus the lack of satisfaction. Now, I must admit that I just realized I have been cheating. There are small reversals, discoveries, and moments of suffering in here. It would be just about impossible to write anything of interest without them I suppose. The first trial went from thirsty to not thirsty, bad-good. The second trial went from thirsty to not going to be thirsty to still thirsty, bad-good-bad. The issue with the story is, it doesn't matter, we have to up the stakes. Thirst, that is uncomfortable in itself, but after a hit and run... Waking up in a ditch, alone, dazed, not sure where the dried blood came from, how much you've lost... Then... Then thirst is more than uncomfortable. It is an animal compulsion. He wasn't sure where he was at first, it was dark now. It seemed like there was a store just over that hill. When the blood is bright does that mean it is from just the mouth, or is it the lungs? Does walking on a broken leg injure it more? He should have taken one of those damn first aid classes. "Damn it." It would have been a yell, but it came out as a bloody cough. This is a much more compelling story because the stakes are higher, the intention is clear, the motivation is strong, and the obstacles are fairly strong. There are some issues with it of course. Why doesn't he just call someone on his cell? Why didn't someone see him on the side of the road? There are places in the US (and we haven't even said it was there) where the traffic is light, the ditches are deep, and there is no cell service, but will our reader realize that as well? I am not sure, but you can see how adding in just a single attribute can change how the story must necessarily develop. There are so many things we can change. Reversals, discoveries, and moments of suffering, of course. As well as intention(s), obstacle(s), stakes, and tactics. Also, perspective, characters, character arc, subplots, and colliding narratives. Lions, and tigers, and bears, oh my! I am not sure where these stories will take me, but I am excited to find out. I will be doing more experiments along the way at JeffreyAlexanderMartin.com if you would like to follow along.